For all the fans who like to enjoy their chocolate combined with marshmallow and nuts, we give you this recipe for Rocky Road Bars. These fudgy and chocolatey cookie bars are winners in our book and we know you won't be disappointed. Many people associate rocky road with ice cream, but we're here to share recipes and let you know that you can also easily turn this wonderful chocolate, marshmallow and nut flavor combination into bars as well as rocky road cookies and easy rocky road brownies! These wonderful bars are fun to make and result in 3 tasty layers - the dense chocolate cake-like base, which is layered with a sweet and nutty cream cheese filling and finally topped off by a chocolate fudge-like frosting with marshamllows. As usual, be sure to thoroughly read all the way through the recipe to make sure you have everything you need before getting started. 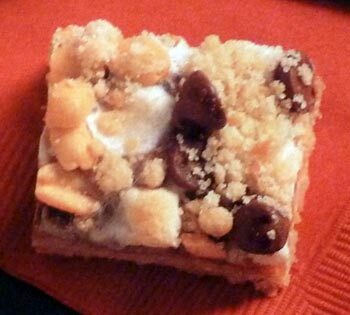 It's a relatively simple recipe to mix up, but it will take a little time to produce these cookie bars. But the time spent mixing and baking will definitely be worth it when it comes time to share with your friends and family. Preheat oven to 350F degrees. Grease and flour 13x9-inch baking pan. In a large saucepan over low heat, melt 1/2 cup butter and 1 ounce chocolate, stirring constantly until well blended. Turn off heat and add 1 cup flour and remaining base ingredients and mix well. Spread base chocolate mixture into prepare baking pan. In a small bowl, combine all filling ingredients - except 1/4 cup nuts and chocolate chips. Beat for 1 minute with an electric mixer on medium speed until smooth and fluffy. Spread filling mixture over chocolate layer in baking pan and then sprinkle chocolate chips evenly on top. Bake at 350F degrees for 25 to 35 minutes or until toothpick inserted in center comes out clean. Remove from oven and immediately sprinkly marshmallows over top. Return pan to oven and bake an additional 2 minutes. In a large saucepan over low heat, combine 1/4 cup butter, milk, 1 ounce chocolate, and reserved 2 ounces cream cheese, stirring until well blended. Remove saucepan from heat and stir in powdered sugar and 1 teaspoon vanilla until smooth. Immediately pour frosting over marshmallows and lightly swirl to marble with knife. Refrigerate until firm and then cut into desired size and shape bars. Line bottom of 13x9-inch baking pan with graham crackers (breaking them to fit if necessary). Bake until graham crackers are lightly toasted, about 8 minutes. Remove pan from oven and sprinkle with almonds. Spoon marshmallow topping over almond layer. In a double boiler set over simmering water, combine chocolate chips and condensed milk in top pan and stir occasionally until melted and smooth. Alternatively, heat chocolate chips and condensed milk in microwave until completely melted (be sure to stir frequently). Pour melted chocolate mixture over marshmallow layer, working quickly to swirl marshmallow and chocolate together with a thin knife. To store, wrap pan with plastic wrap and refrigerate. This recipe makes about 18 Easy Fudgy Rocky Road Bars. Preheat oven to 350F degrees. Grease and flour a 9-inch square baking pan. In a small mixing bowl with an electric mixer on low speed, beat flour, oats, sugar, butter, baking soda and salt until mixture is crumbly, about 1 to 2 minutes. Reserve 3/4 cup of the crumb mixture and press the remaining mixture into bottom of prepared pan. Bake for 12 to 17 minutes, or until crust is lightly browned. For the filling, spread caramel topping evenly over hot crust. Sprinkle nuts, mini marshmallows and chocolate chips over the caramel layer. Crumble remaining 3/4 cup reserved crumb mixture over top. Continue baking for 20 to 25 minutes, or until crumble topping is lightly browned. Cover and refrigerate 1 to 2 hours, or until firm.. 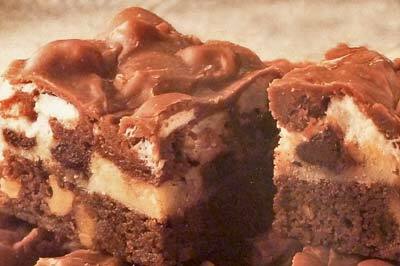 This recipe makes about 2 1/2 dozen Caramel Rocky Road Bars.